Where's Claire this Winter? Here's the full list of weekly yoga classes in Holyhead, Aberffraw and Llanfachraeth. Plus workshops, restorative yoga sessions, retreats, mini retreats and much more! A day of active movement and meditative practice exploring the magic of yoga and the mysteries of bellydance with Rachel Walker and Claire Mace. No prior experience of either yoga or bellydance required! Welcome to my website. I am Claire Mace, yoga teacher and massage therapist. Summer term: 29th April – 11th July (no classes in half term 27th – 30th May). Wednesdays 6pm-7.30pm in Llanfachraeth – Small group open level (beginners and improvers) – £10 to drop in, or prepay £70 for 9 sessions. Thursdays 10am-11.30am in Llanfachraeth – Small group intermediate level (experienced yogis) – £10 to drop in, or prepay £70 for 9 sessions. Thursdays midday-1pm in Llanfachraeth – Small group suitable for people new to yoga, people who are pregnant or post-natal and people working with ongoing health conditions or injuries – £10 to drop in, or prepay £70 for 9 sessions. Concessionary rates at a 50% discount are available for people who are struggling financially and would otherwise be unable to attend. If you have specific injuries or goals that you want to work with and improve your health, wellness and longevity, I offer massage and reflexology treatments in Llanfachraeth. Or if group yoga classes don’t work for you due to timings or if you want support working with specific issues or goals, one to one lessons are the way to go. Appointments are currently available on Tuesdays, Wednesdays and Thursdays. Other days are sometimes possible by arrangement. Get in contact to discuss or call 07970 409 724. Pregnant people are welcome to come to my small group weekly classes in Llanfachraeth on Wednesday evenings at 6pm or Thursdays at midday, after the first three months of pregnancy. I am also able to do 2-3 hour pregnancy yoga workshops at the weekends, if you are able to get at least 3 pregnant ladies together. Get in contact to have a chat about how I can help support you with yoga during and after pregnancy. 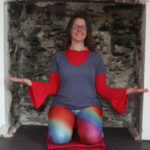 Igniting the Core Flame, a day exploring core connection through bellydance and yoga, Saturday 31st August. More here. Enjoyed a class? Write me a review on Facebook or YogaTrail.